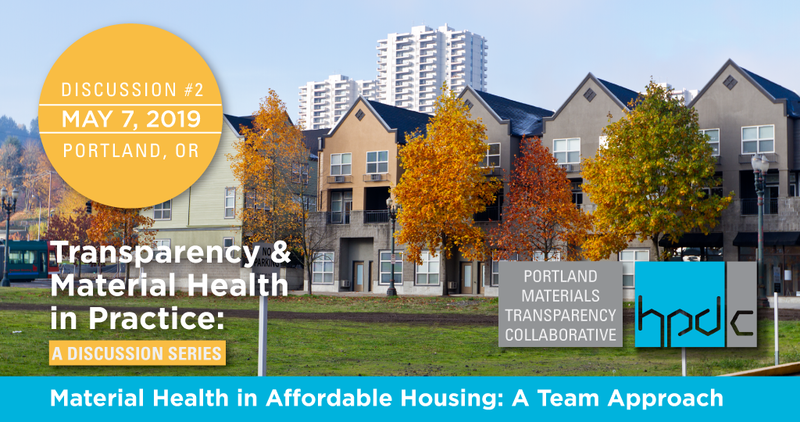 Portland Materials Transparency Collaborative (PMTC) and Health Product Declaration Collaborative (HPDC) invite you to the “Material Health in Affordable Housing: A Team Approach” discussion in our continuing Discussion Series: Transparency and Material Health In Practice. Architecture and design professionals, contractors and owners will get practical answers to questions that you are likely to encounter as you take the next steps to integrate healthy materials practices into product selection and specification in your projects. Upcoming In Discussion #2: Each building product and material used in construction has a direct impact on resident health and wellbeing. The aggregation of these effects on an individual can be significant, especially when considering vulnerable populations, such as those served by Affordable Housing. This discussion will bring together developers, advocates and researchers alike to discuss how the Affordable Housing industry may better serve human health in their project development process. Where are the biggest opportunities and roadblocks? What tools and research are available? How do we come together to holistically create new partnerships and streamline the process for those selecting materials?